the reef special is a fly that i originally designed to fish around the oama (juvenile goatfish) schools in the summer for trevally. like the oama that it was designed to resemble, the reef special has caught just about every saltwater fish out there including trevally (both locally and around the pacific), bonefish, barracuda, and numerous reef species. the beauty of the reef special is in its simplicity. 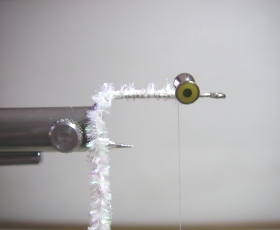 it is basically a clouser minnow that was tweaked for our local waters. the use of chenille gives the fly a little bulkier belly and the use of polar flash and white and yellow craft fur loosely resemble the colors found in the oama. despite being developed thirteen years ago, it remains the best selling fly in the shop and it is hard to find anyone �in the know� about fly fishing in hawaii that won�t vouch for its effectiveness. wing: pearl polarflash, white craft fur, yellow craft fur. tie on the real eyes plus. leave ample space (between the hook eye and the real eyes plus) to tie in the wing later without clogging the eye. next tie in the variegated chenille starting right behind the eyes and ending a little past the hook point. don't make the body too long you want it to just represent the belly of the fish. bring the thread back behind the eye. wrap the chenille forward and tie off behind the eye. 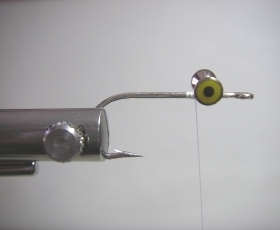 advance the thread infront of the eye and rotate the hook. tie in about fourteen strands of polar flash at the half way point. (so that half of the flash is backward and the other half is pointed forward. fold the flash facing forward back and secure with thread wraps. now tie in a bunch of white craft fur. the wing should be between is one and a half to two times the hook length. tie one more bunch of yellow craft fur that is a little longer than the white wing. build up a nice thread head and whip finish. finish the fly by trimming the polar flash at an angle even with the craft fur wing. that's it. tie up and fish some reef specials and discover for yourself why sometimes the simple things in life are the best. good times.